The reason for the increase is commerce. Business is booming along Asia's Pacific Rim, and business travel is booming with it. 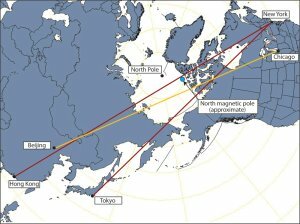 On our spherical Earth, the shortest distance from Chicago to Beijing or New York to Tokyo is over the North Pole. Suddenly, business travelers are spending a lot of time in the Arctic. 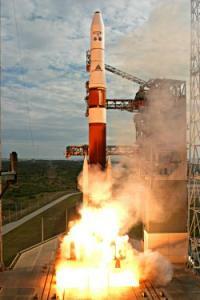 “Our next-generation satellite will be even better,” says Hill. Slated for launch in 2014, GOES-R will be able to photograph the Sun through several different X-ray and ultra-violet filters. Each filter reveals a somewhat different layer of the Sun's explosive atmosphere — a boon to forecasters. Also, advanced sensors will alert ground controllers to a variety of dangerous particles near Earth, including solar protons, heavy ions and galactic cosmic rays. For the latest space weather report, visit the website of the Space Weather Prediction Center at http://www.sec.noaa.gov/. For more about the GOES-R series spacecraft, see http://goespoes.gsfc.nasa.gov/goes/spacecraft/r_spacecraft.html. For help in explaining geostationary orbits to kids — or anyone else — visit The Space Place at http://spaceplace.nasa.gov/en/kids/goes/goes_poes_orbits.shtml. CloudSat is one of the Earth observing satellites collecting data that will help develop and refine atmospheric circulation models and other types of weather and climate models. 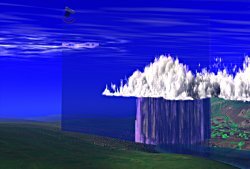 CloudSat's unique radar system reads the vertical structure of clouds, including liquid water and ice content, and how clouds affect the distribution of the Sun's energy in the atmosphere. To see animation of this data simulation, Click Here. The story goes that a butterfly flapping its wings in Brazil can, over time, cause a tornado in Kansas. The “butterfly effect” is a common term to evoke the complexity of interdependent variables affecting weather around the globe.Â It alludes to the notion that small changes in initial conditions can cause wildly varying outcomes. Now imagine millions of butterflies flapping their wings.Â And flies and crickets and birds.Â Now you understand why weather is so complex. All kidding aside, insects are not in control.Â The real “butterfly effect” is driven by, for example, global winds and ocean currents, polar ice (melting and freezing), clouds and rain, and blowing desert dust.Â All these things interact with one another in bewilderingly complicated ways. And then there's the human race. If a butterfly can cause a tornado, what can humans cause with their boundlessly reckless disturbances of initial conditions? Understanding how it all fits together is a relatively new field called Earth system science. Earth system scientists work on building and fine–tuning mathematical models (computer programs) that describe the complex inter–relationships of Earth's carbon, water, energy, and trace gases as they are exchanged between the terrestrial biosphere and the atmosphere.Â Ultimately, they hope to understand Earth as an integrated system, and model changes in climate over the next 50–100 years.Â The better the models, the more accurate and detailed will be the image in the crystal ball. NASA's Earth System Science program provides real–world data for these models via a swarm of Earth–observing satellites.Â The satellites, which go by names like Terra and Aqua, keep an eye on Earth's land, biosphere, atmosphere, clouds, ice, and oceans.Â The data they collect are crucial to the modeling efforts. Some models aim to predict short–term effects — in other words, weather.Â They may become part of severe weather warning systems and actually save lives. Other models aim to predict long–term effects — or climate.Â But, long–term predictions are much more difficult and much less likely to be believed by the general population, since only time can actually prove or disprove their validity.Â After all, small errors become large errors as the model is left to run into the future.Â However, as the models are further validated with near– and longer–term data, and as different models converge on a common scenario, they become more and more trustworthy to show us the future while we can still do something about it — we hope. For a listing and more information on each of NASA's (and their partners') Earth data–gathering missions, visit science.hq.nasa.gov/missions/earth.html. Kids can get an easy introduction to Earth system science and play Earthy word games at spaceplace.nasa.gov/en/kids/earth/wordfind. In case it is ever found by intelligent beings elsewhere in the galaxy, Voyager carries a recording of images and sounds of Earth and its inhabitants. 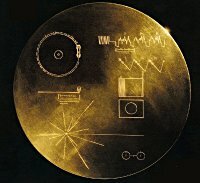 The diagrams on the cover of the recording symbolize Earth's location in the galaxy and how to play the record. Tonight, when the sun sets and the twilight fades to black, go outside and look southwest. There's mighty Jupiter, gleaming brightly. It looks so nearby, yet Jupiter is 830 million km away. Light from the sun takes 43 minutes to reach the giant planet, and for Earth's fastest spaceship, New Horizons, it's a trip of 13 months. Not far to the left of Jupiter is Pluto. Oh, you won't be able to see it. Tiny Pluto is almost 5 billion km away. Sunlight takes more than 4 hours to get there, and New Horizons 9 years. From Pluto, the sun is merely the brightest star in a cold, jet-black sky. As Stone explains, our entire solar system—planets and all—sits inside a giant bubble of gas called the heliosphere. The sun is responsible; it blows the bubble by means of the solar wind. Voyager 1 has traveled all the way from the bubble's heart to its outer edge, a gassy membrane dividing the solar system from interstellar space. This “membrane” is the heliosheath. Keep up with the Voyager mission at voyager.jpl.nasa.gov. To learn the language of Voyager's messages, kids (of all ages) can check out spaceplace.nasa.gov/en/kids/vgr_fact1.shtml . For over 40 years, the “Mars” 70-m Deep Space Network antenna at Goldstone, California, has vigilantly listened for tiny signals from spacecraft that are billions of miles away. The technologies pushing robotic space exploration have been like that. Improvements in the supporting communications and data processing infrastructure on the ground (the “ears” of the scientists) have allowed spacecraft to go farther, be smaller and smarter, and send increasingly faint signals back to Earth—and with a fire hose instead of a squirt gun. 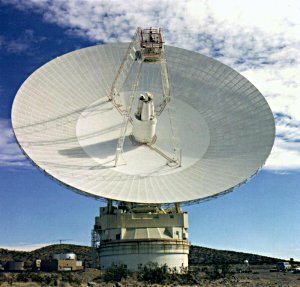 Since 1960, improvements in NASA's Deep Space Network (DSN) of radio wave antennas have made possible the improvements and advances in the robotic spacecraft they support. “In 1964, when Mariner IV flew past Mars and took a few photographs, the limitation of the communication link meant that it took eight hours to return to Earth a single photograph from the Red Planet. By 1989, when Voyager observed Neptune, the DSN capability had increased so much that almost real-time video could be received from the much more distant Planet, Neptune,” writes William H. Pickering, Director of JPL from 1954 to 1976, in his Foreword to the book, Uplink-Downlink: A History of the Deep Space Network, 1957-1997, by Douglas J. Mudgway. Mudgway, an engineer from Australia, was involved in the planning and construction of the first 64-m DSN antenna, which began operating in the Mojave Desert in Goldstone, California, in 1966. This antenna, dubbed “Mars,” was so successful from the start, that identical 64-m antennas were constructed at the other two DSN complexes in Canberra, Australia, and Madrid, Spain. When severe weather occurs, there's a world of difference for people on the ground between a storm that's overhead and one that's several kilometers away. Yet current geostationary weather satellites can be as much as 3 km off in pinpointing the true locations of storms. “Satellites eventually wear out or get low on fuel, so we've got to launch new weather satellites every few years if we want to keep up the continuous eye on weather that NOAA has maintained for more than 30 years now,” says Thomas Wrublewski, liaison officer for NOAA at NASA's Goddard Space Flight Center. Currently, GOES-N is in a “parking” orbit at 90° west longitude over the equator. For the next 6 months it will remain there while NASA thoroughly tests all its systems. If all goes well, it will someday replace one of the two active GOES satellites?either the eastern satellite (75°W) or the western one (135°W), depending on the condition of those satellites at the time. Unlike all previous GOES satellites, GOES-N carries star trackers aboard to precisely determine its orientation in space. Also for the first time, the storm-tracking instruments have been mounted to an “optical bench,” which is a very stable platform that resists thermal warping. These two improvements will let scientists say with 2 to 4 times greater accuracy exactly where storms are located. Find out more about GOES-N at goespoes.gsfc.nasa.gov/goes. Also, for young people, the SciJinks Weather Laboratory at scijinks.nasa.gov now includes a printable booklet titled “How Do You Make a Weather Satellite?” Just click on Technology. You punch in the coordinates and your telescope takes off, slewing across the sky. You tap your feet and stare at the stars. These Messier marathons would go much faster if the telescope didn't take so long to slew. What a waste of time! Don't tell that to the x-ray astronomers. “We're putting our slew time to good use,” explains Norbert Schartel, project scientist for the European Space Agency's XMM-Newton x-ray telescope. The telescope, named for Sir Isaac Newton, was launched into Earth orbit in 1999. It's now midway through an 11-year mission to study black holes, neutron stars, active galaxies and other violent denizens of the Universe that show up particularly well at x-ray wavelengths. For the past four years, whenever XMM-Newton slewed from one object to another, astronomers kept the telescope's cameras running, recording whatever might drift through the field of view. The result is a stunning survey of the heavens covering 15% of the entire sky. 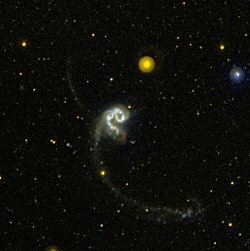 Sifting through the data, ESA astronomers have found entire clusters of galaxies unknown before anyone started paying attention to “slew time.” Some already-known galaxies have been caught in the act of flaring?a sign, researchers believe, of a central black hole gobbling matter from nearby stars and interstellar clouds. 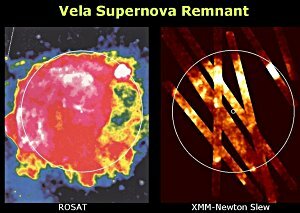 Here in our own galaxy, the 20,000 year old Vela supernova remnant has been expanding. XMM-Newton has slewed across it many times, tracing its changing contours in exquisite detail. Artist's rendering of a four-quadrant solar sail propulsion system, with payload. NASA is designing and developing such concepts, a sub-scale model of which may be tested on a future NMP mission. 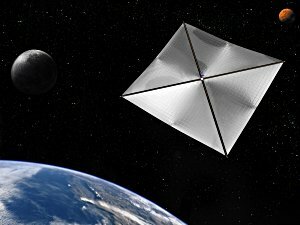 When exploring space, NASA naturally wants to use all the newest and coolest technologies—artificial intelligence, solar sails,šonboard supercomputers, exotic materials. But “new” also means unproven and risky, and that could be a problem. Remember HAL in the movie “2001: A Space Odyssey”? The rebellious computer clearly needed some pre-flight testing. Testing advanced technologies in space is the mission of the New Millennium Program (NMP),šcreated by NASA's Science Mission Directorate in 1995 and run by JPL.š Like the daredevil test pilots of the 1950s whošwould fly the latest jet technology, NMP flies newštechnologies in space to see if they're ready for prime time.š Thatšway, future missions can use the technologies with much less risk. Example: In 1999, the program's Deep Space 1 probe tested a system called “AutoNav,” short for Autonomous Navigation. AutoNav used artificial intelligence to steer the spacecraft without human intervention. It worked so well that elements of AutoNav were installed on a real mission, Deep Impact, which famously blasted a crater in Comet Tempel 1 on July 4, 2005. Without AutoNav, the projectile would have completely missed the comet. Some NMP technologies “allow us to do things that wešliterally could not do before,” says Jack Stocky, Chief Technologist for NMP.š Dozens of innovative technologies tested by NMP willšlead to satellites and space probes that are smaller, lighter, morešcapable and even cheaper than those of today. Why is the sky blue? Why does the sky sometimes turn red at sunset? Every curious child will ask these question at some point. Are you ready to give scientifically correct and simple answers?